Minister Church elders and committee members L to R: (seated) Robert Black (elder), Rev Dr Fred Greenfield and Robin Eccles (elder). 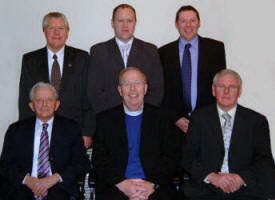 (back row) Alan Wasson, Deryck Moore (elder) and Stephen Brown. In the late 1940’s and 1950’s God was using Dr. Ian Paisley in a most mighty way in Gospel campaigns. At that time many souls around Ulster were brought to Christ. Two of theses old-fashioned Missions were conducted in Lisburn Orange Hall and afterwards in Derriaghy Mission Hall. A few brethren with a burden for souls including the late Tommy Dugan, who was Clerk of Session in Dunmurry in earlier days, met for prayer in an old cottage, now demolished, on the Mosside Road. A Gospel Mission was planned for Dunmurry on the site where the new Free Presbyterian Church would be opened in 1957. The Mission met with tremendous opposition. The prayer meeting in Brankin’s garage on Glenburn Road was stoned. Harry McComb recalls the opposition “the tent was slashed and the pulpit was smashed on a Saturday evening but on the Lord’s Day five souls were gloriously saved”. Douglas was appointed to look after the congregation. During the vacancy in October 1965 the Presbytery appointed Mr. William Beattie to be the student minister. Mr. Beattie was subsequently called and ordained in 1967. In 1966 the Rev. Brian Green from London was mightily used of God in a dual Mission – each evening he conducted a Children’s Mission prior to the main Mission, and many souls were saved. Prior to 1957, meetings were held in a Band Hall at the rear of Dunmurry Inn. 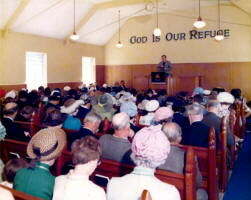 In 1957 the congregation moved to a small hall on the Glenburn Road and as can be seen from the photo of the congregation taken the following year, the meetings were very well attended with two buses bringing some members of the congregation from as far afield as Suffolk, Lenadoon and the Falls Road. 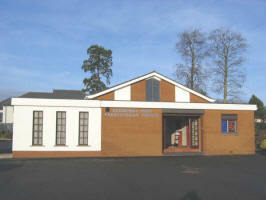 The congregation subsequently outgrew the first building on Glenburn Road (now the Church of God), and the present Dunmurry Free Presbyterian Church at Seymour Hill was opened for worship on 2nd September 1978. The Rev William Beattie retired from active ministry on 31st December 2005 and during the vacancy, the congregation was under the care of the Interim Moderator, the Rev Dr Stanley Barnes, minister of Hillsborough Free Presbyterian Church. The Rev Dr Fred Greenfield, formerly of Newtownards Free Presbyterian Church, was installed on Thursday 25th January and commenced his ministry on Sunday 28th January. In the late 1940s and 1950s Dr Ian Paisley conducted gospel campaigns and two of these old-fashioned meetings were held in Lisburn Orange Hall and afterwards in Derriaghy Mission Hall. A few brethren met for prayer in an old cottage, now demolished, on the Mosside Road. A gospel mission held on the site of what was to become their first church, met with tremendous opposition and the prayer meeting in Brankin’s garage on Glenburn Road was stoned. The first minister, the Rev David Leathem, was followed by the Rev Alan Cairns and later the Rev John Douglas was minister in charge. Meetings were held in a band hall at the rear of Dunmurry Inn and in 1957 the congregation moved to a small hall on the Glenburn Road. The meetings were well attended with two buses bringing some members of the congregation from as far afield as Suffolk, Lenadoon and the Falls Road. 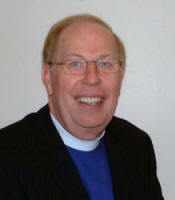 In October 1965 Mr William Beattie was appointed student minister and he was subsequently called and ordained in 1967. The congregation outgrew the building on Glenburn Road and the present Dunmurry Free Presbyterian Church at Seymour Hill was opened for worship on 2nd September 1978. The Rev William Beattie retired from active ministry in December 2005 and the present minister, Dr Fred Greenfield, was installed on 25th January 2007.